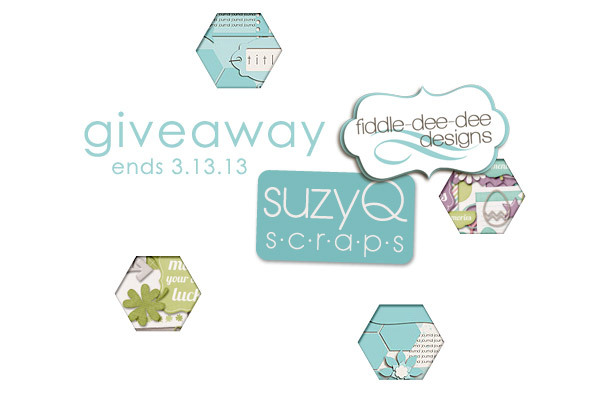 Fiddle-Dee-Dee Designs: March Giveaway with SuzyQ Scraps! Hello there! It's almost Spring . . . in just a few days it will be official, but here in Florida, the azaleas think it's already happened! My family went to my mom's on Sunday for a late birthday lunch for my husband, and we went outside afterwards to stroll around my mom's beautiful garden. I thought I would give you a partial peek of the gorgeousness we enjoyed! In addition to Spring arriving, I'm so excited to share with you today a new giveaway featuring not only the two new templates sets I'm releasing on March 15th, but also the new products that SuzyQ Scraps is releasing on the 15th as well! And it's so super easy to enter the giveaway~ just click on "ENTER TO WIN" below and that's it! The giveaway ends March 13, 2013 at 11:59 pm EST/10:59 pm CST. 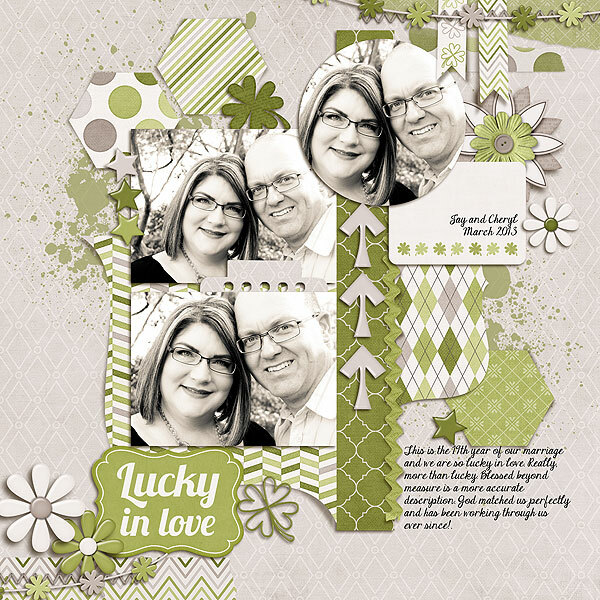 Here's a peek at one of my templates combined with Suzy's kit. My daughter took these pictures of me and my husband on Sunday. So glad to have you stop by today. As always, I'm hoping that my templates will help you make stunning creations for your family memory albums! Good luck to those entering the giveaway! Thank you for a chance to win some of your templates. Your very generous! I'm really like the hexagons, such a fun shape! We don't really have any Easter or St. Patrick's traditions other then candy! Maybe we should work on that! Thanks for the giveaway, both of you make some stunning things! Love your templates! Thanks for the giveaway! LOVE your templates, but you already know that. :) Thanks for the chance to win! Love your templates!! Thanks for the chance. We always color hard boiled eggs on Saturday and huntfor them on easter morning. The kids get a kick out of trying to find the eggs they each colored. When our daughter was in college with no car to get herself home, we had an Easter tradition of going to visit her and going some place like the zoo or a museum & then out to eat. We found it was a great day to enjoy out as a family as so few people were there that day. I would love to win. Your templates are awesome and Suzy´s kit are gorgeous! I didn't know you had a blog. Duh i guess i am behind. Beautiful pictures and post. Thanks! These look so cute! Thanks for the chance to win them! What a great giveaway! Thanks so much for the chance! Can't wait to see your templates! in Indonesia we don't celebrate St Patrick Day. But we celebrate easter with go to church and then go search egg and coloring them. It's fun! thank you fr chance of get the awesome prize! Thanks for the chance to enter and win - yeah! Thank you for the opportunity to win. Beautiful layout, too. Thanks for the chance to win! I love it when the azaleas are in bloom. This is great, thanks for the chance to win. We go to church on Easter and sometimes go to an easter egg hunt. Super cool! Thanks for the chance to win! What an awesome giveaway!! We don't quite have any traditions in my family for the holidays, but I always look forward to spending time with both of my nephews!! 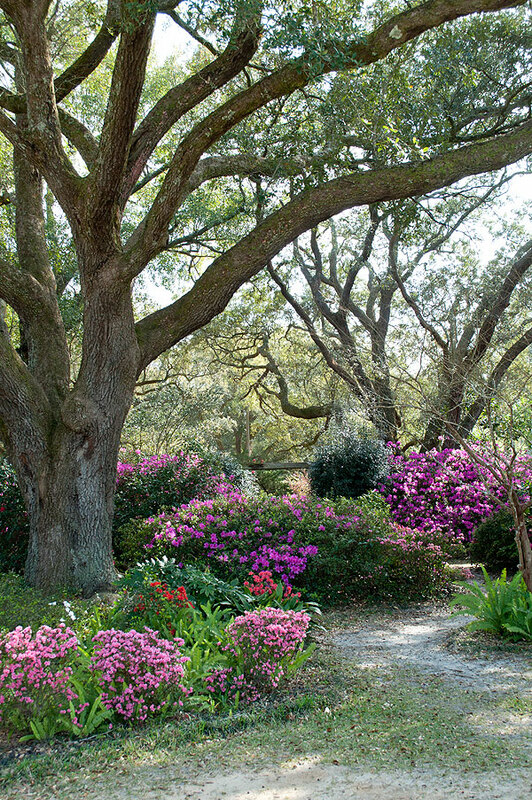 Beautiful garden photo - thanks for the glimpse of spring, and for the chance to win. TYVM for chanc to win!!! Miss your templates and would love to win one. Thank you so much for a chance to win some of your templates. St Patrick's Day in our house involves lamb shanks and clocannon for dinner. the only day of the year i make colcannon. as much green as possible and of course, guinness. For St Patty's day we always wear green. For Easter we spend it with family....enjoying a nice meal, hunting for eggs, etc. thanks so much for the chance to win.and ur mom's garden is so gorgeous! Every year for Easter we have a large Easter egg hunt with my family. The kids absolutely love it! Thanks for the chance to win!! Can't wait to see the complete reveal. Since I've been to Ireland and celebrated St. Paddy's overthere, I hope I have the Luck of the Irish to win. Thanks for the chance! The colors in the layout look great with the photos. Thanks for the chance to win! Love you layout. You rocked this one. super layout!! Thanks for the chance to win!! St. Paddy's Day is my birthday. That's how I always celebrate it!! I want to live in your mom's backyard! GORGEOUS!!! We take our son to a church egg hunt then we do a plastic egg hunt here at home. This is a gorgeous layout. I love the color scheme and all the elements that were used. I would love to win.